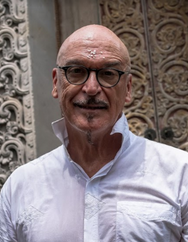 The next edition of the Bale Banjar Culture Club takes place at the Ayodya Resort Bali in Nusa Dua on Sunday, May 13, 2018, features two performing arts luminaries – Peter J. Wilson and Made Sidia speaking on combining tradition art performance in contemporary theatrical settings. Two legendary men of the theatre, Australian Peter J. Wilson and Balinese Made Sidia, have collaborated in creating modern masterpieces that include the longest running stage show in the Island’s history at the Bali Agung Theatre at the Bali Safari & Marine Park and the two recently premiered Balinese Living Arts Shows in Ubud. 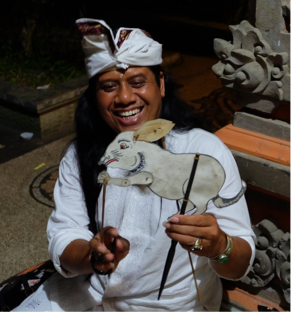 While music, dance and the fine arts are a central feature of Balinese society, how is it evolving and adapting amidst the din and competition of the “entertainment on demand” era? How do theatre, art and social comment through the arts have a place within arts that are steeped in a wonderful tradition? Made Sidia and Peter Wilson have worked together over the past 20 years creating innovative ways of communicating Balinese culture based on centuries old traditions, making the Island’s culture accessible to a new generation of both Indonesian and international audiences. Not to be missed! Two world-class storytellers and showmen at the height of their artistic powers. Diana Darling is an American-born writer and editor who has lived in Bali since 1980. She spent the 1970s in Carrara (Italy) and Paris, where she worked as a sculptor. She lives in Ubud in the family compound of her husband, Anak Agung Alit Ardi, to whom she has been married since 1992, the year of the publication of her first book, The Painted Alphabet (Houghton Mifflin), a novel based on a Balinese tale. The New Yorker called it "a little gem of a novel." Since then, she has written for numerous books and periodicals on Balinese culture and society. From 2002 to 2004 she was editor-in-chief of the magazine Latitudes. She is currently a freelance writer and editor. Diana will share excerpts from her writings that reflect a deep understanding of Balinese culture and mysticism. Arriving in Bali during the “years of living dangerously,” Jan raised her young family from within the confines of a Balinese compound while tumultuous events of precipitated by the “failed” coup of 1965 unfolded around her. Many historians claim that the bloodletting and social upheaval that followed the "night of the generals" reached its frenzied peak in Bali 1965-1966 as Jan protectively clung to her children as angry crowds marched down Bali's streets. Food and daily essentials, such as soap, were hard to come by as neighbors whispered over backyard walls about acquaintances who had suddenly disappeared and local rivers and beaches strewn with the bodies of the newly massacred. Held on the second Sunday of every month, the Bale Banjar Culture Club is a pioneering community outreach by the Ayodya Resort Bali to support and encourage a wider understanding of Balinese culture and history. Each Bale Banjar Culture Club gathering starts at 7:00 pm. Admission is without charge with a cash bar available starting from 6:00 pm.